MONTREAL, QC – McAuslan Brewery has announced the debut of its first entry into the increasingly popular cider category. McAdam Urban Cider – named after John McAdam, “the Scotsman who paved the way with asphalt, today’s ubiquitous symbol of urbanization” – is a “crisp, balanced” 4.7% abv cider made using Quebec-grown apples, including a portion harvested from a small urban orchard on McAuslan’s land in Montreal’s Saint-Henri neighbourhood. 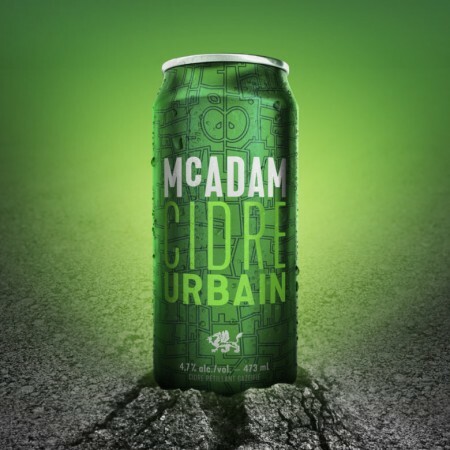 McAdam Urban Cider will be available in 473 ml cans at grocery and convenience stores throughout Quebec starting the week of September 25th.